Galaxy Note 10.1 Black screen, no picture, 5 faint lights from bottom to top. I dropped my tablet, and now the screen had stopped working. Tablet seems to be working normally. There is no picture, but 5 faint light-strips emanating from the bottom. I've tried disconnecting and reconnecting the LCD cable, but no change. Welcome to Android Central! Since you've already checked the screen connection, it probably has more to do with the backlight or the LCD screen itself. You'll likely have to bring it to a repair shop, or try to replace the screen yourself. I'll see if one of our members, @Beut (who knows a lot about the inner workings of Samsung tablets), can help. LCD cable should be check on both sides, many skip the connector on LCD which also cause the problem. 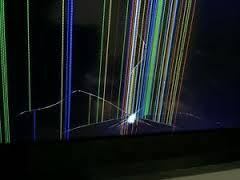 There are other ways to verify the LCD condition such as HDMI adapter and connected to a TV. If you can post a picture, I could tell the LCD is broken or loose LCD cable. This is an example of cracked LCD but many people believe it's bad mainboard. Bad mainboard will have consistent vertical or horizontal lines, not web lines of crack. How do I disable music other people have to hear when I put them on hold?